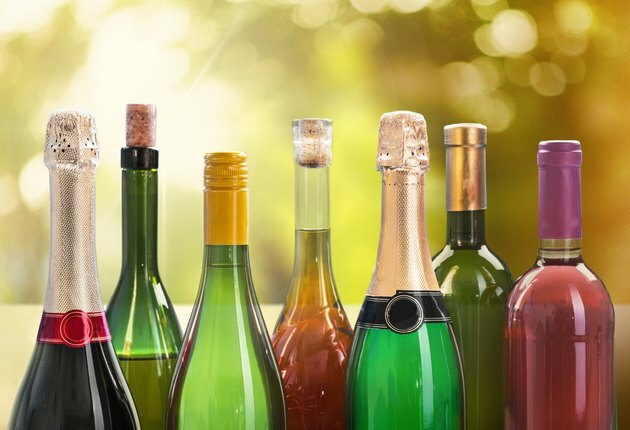 Drinking alcoholic beverages is one way to add to a celebration, but you might be alarmed to learn that drinks are high in calories and low in nutrition. For example, the U.S. Department of Agriculture lists all of the nutritional information in one can of regular beer, and the only significant component is carbohydrates. CalorieKing reports that the same can of beer has 12.8 grams of carbohydrates. Beer comes in many varieties, and the number of calories contained depends on the variety you choose. CalorieKing notes that the average can of regular beer contains 153 calories, while the average can of light beer contains 103 calories. If you choose the low-alcohol variety, the average 12-ounce can contains only 76 calories. Like beer, the calories in a five-ounce glass of wine vary by the type you drink. According to CalorieKing, the average glass of dry white wine contains 120 calories, and the average glass of red wine has 127 calories. If you drink sparkling wine, one five-ounce glass contains 96 calories. One jigger of liquor contains 1.4 to 1.5 ounces, and the choice among varieties is nearly endless. CalorieKing reports that one jigger of vodka, tequila, whiskey, scotch, rum or gin contains 97 to 103 calories, depending on the type of liquor and brand.